We were delighted with the Golcar airtightness test , undertaken by Leeds Beckett University’s Centre for the Built Environment, which came in at 0.25 ach @ 50 Pa – our best airtightness result yet. The results for previous projects were Denby Dale (0.33 ach @ 50 Pa) and Stirley Farm EnerPHit (0.36 ach @ 50 Pa). 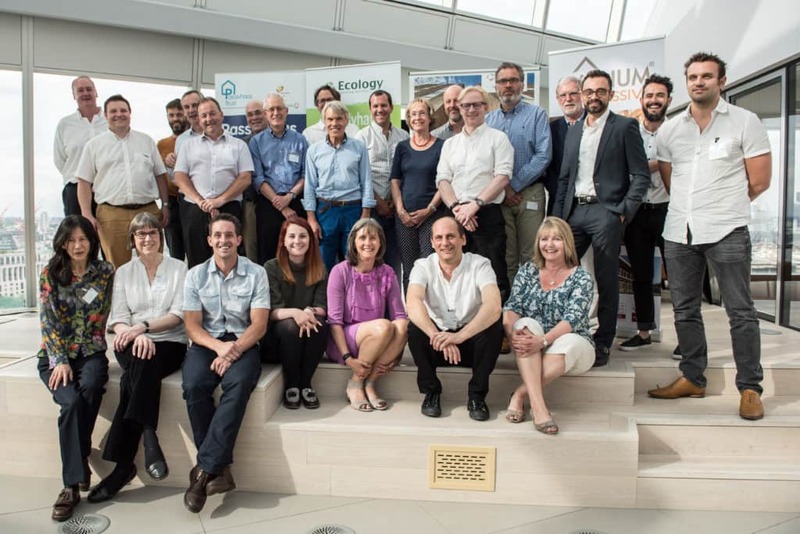 This really does go to show that Passivhaus can get under the skin of a building team very quickly and is encouraging for the uptake of Passivhaus within the UK construction industry.. I feel that I have hardly had to supervise/ be on site at all with this project – the team have just got on with it. The impressive airtightness result has had a knock on effect (when in PHPP software) of reducing the predicted space heating need at the house to an amazing 8.7 kWh/m2/ year. Why is the space heating demand so low? It is generally good practice when undertaking Passivhaus design to aim somewhat under the 15 kWh/m2.a target to give some room for error on site or in the design. The Passivhaus benchmark 15 kWh/m2/year is at the cost optimal point, particularly in terms of lifecycle costs. Beyond this one quickly moves into the law of diminishing returns, where the costs can rapidly escalate for very small incremental improvements. 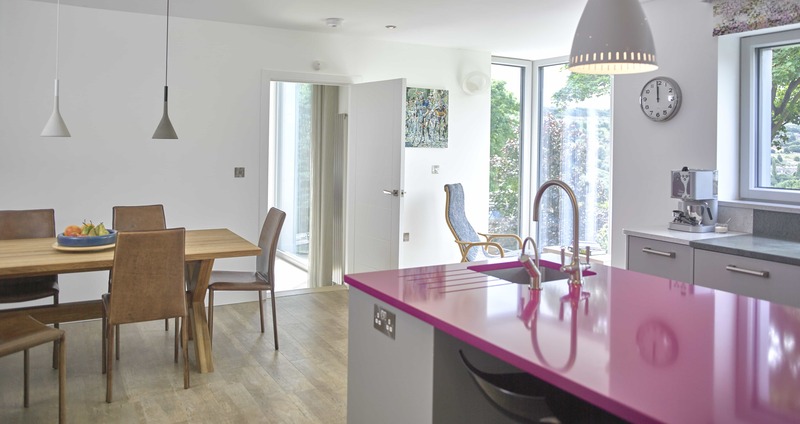 Had we known that we would achieve such a low space heating demand, we could have made choices, such as reducing the size of the cavity or the thickness of underfloor insulation. On large scale projects, cost engineering of this sort can be critical. The airtightness figure was much better than we had modelled for, with consequent knock on effect on PHPP calculations and space heating requirements. Even with our proven track record, we believe it is sensible to be prudent at the design stage, so we would always expect some degree of undershoot because of this. There was a change of window and door specification quite far along the design process. . Originally we were going to use windows from our ULTRA range at the project, but this was later switched for the PROGRESSION range, which offered an even lower U value as well as narrow sightlines and a virtually invisible frame, which also increased passive solar gain. Lastly, our Senior Construction Technician Paul Smith, who undertook all the PHPP modelling of the house, worked with quite conservative Psi value estimates in his initial calculations, which we were eventually able to improve upon. We will be monitoring and sharing gas meter readings and bills over the next few years to examine how the house is performing. The first year’s meter readings are showing slightly elevated gas consumption over what we would expect, suggesting that the house is still ‘drying out’ during its first year. “We are really enjoying the pleasure of living in a house with a consistent and even temperature. It never drops below 19 degrees and varies by about 3 degrees above that. The house is not at all fusty-smelling. There is always a fresh and comfortable warmth in the atmosphere with no wet or moist patches anywhere in the house. Clothes dry quickly and almost straight away. There’s no need for extras – like underfloor heating, a glut of radiators, real fires – it just offers constant, economical comfortable living. We’ve not had any problems with overheating we have a good shading strategy with the mature trees outside our south facing glazing. It is easy to regulate the temperature in the house by opening the appropriate windows if needed.